As an experienced source whose work has helped generate lots of news stories, I've never had a reporter refuse to provide me with a copy of a story to which I'd contributed. WCPO-Digital, a new Internet venture owned by Cincinnati-based media conglomerate E.W. Scripps, requires sources to become paid subscribers in order to read stories in which they participated. 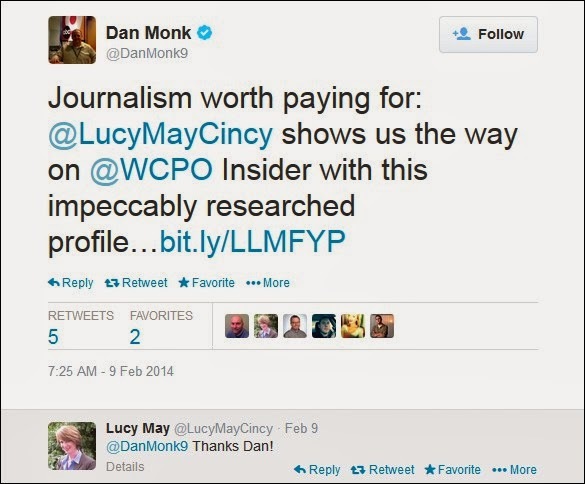 In other words, sources provide their time and information for free to WCPO-Digital reporters, but must pay for the privilege of reading the results. The policy came to my attention as a result of the February 9, 2014 WCPO-Digital story by staff reporter Lucy May, Henry Heimlich: At 94, Cincinnati's famous, polarizing doctor still working to shape his legacy. Click the title link and you'll learn the story's behind a subscription paywall. Part of Ms. May's story is about my research into my father's bizarre career and my efforts to bring the information to public attention. I was also a principle source for story and Ms. May used quotes from an interview I gave her. Yesterday I e-mailed some questions about WCPO-Digital's "no free articles for sources" policy to Carolyn Micheli, communications veep at E.W. Scripps. I'll be reporting the results in a future Sidebar item.